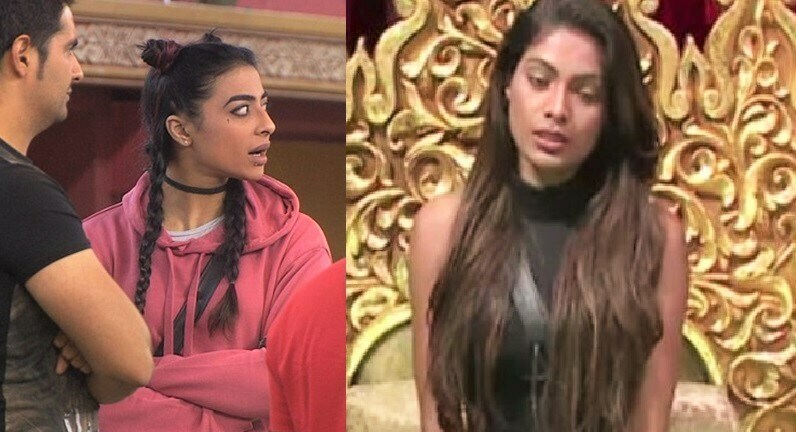 Tension kept mounting today in Weekend ka Vaar among the Bigg Boss contestants as the show host Salman Khan took quite some time to finally announce the name of the evicted contestant, Akanksha Sharma, who is the second commoner to bid adieu, the first being Priyanka Jagga. Yes, Akansha, who grabbed the headlines for openly speaking about the troubles in her marriage with the very popular Indian cricketer Yuvraj Singh’s younger brother Zorawar is out of the house and the most affected of all’s commoner Nitibha Kaul as the two got along very well on the show. Akanksha caught the viewers’ attention right from the beginning when she blamed her mother-in-law, Shabnam Singh for her failed marriage. She also confided in her fellow contestant, Gaurav Chopra and claimed that the Singh family made her starve for money and it was a struggle to get Rs 3,000 a month. All this had irked Shabnam who came out in the open and made some counter-allegations on Akanksha. 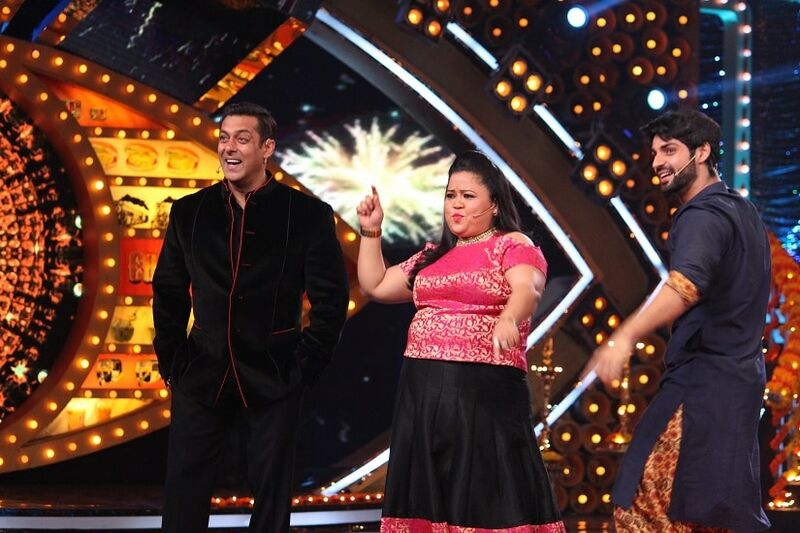 Salman Khan with Bharti Singh and Karan Wahi. Earlier, Salman flagged off tonight's episode on a sweet note as he danced with young kids to a mashup of ‘Aaj Ki Party’ and ‘Happy Diwali’ numbers. He then proceeded to hand out gifts to his dance crew, while revealing that the children are actually from an orphanage. Meanwhile, Salman continued cracking jokes on Om Swami and came up with about half a dozen alternate career options for him to select while showcasing a montage. He further introduced two games - The Laddoo game and The Thappad game before setting a festive mood. While the laddoo game enabled the contestants to choose the one whose presence could be avoided in the Bigg Boss house, the thappad game revealed the biggest liars amongst the contestants. In the thappad task, the contestants are made to sit solo in a dark room and were asked questions by Bigg Boss. For every wrong answer, they get slapped. Contestants like Gaurav Chopra, Manu Punjabi, Lopamudra Raut and Navin Prakash get slapped for their wrong answers. For instance, when Gaurav disagrees that he's not the mastermind behind all the celebrities, he is slapped by the Bigg Boss as the contestants don’t agree with him. Joining Salman Ki Sabha was a panel of three housewives from different cities and they were seen sharing their opinions about the performance of the celebrities and Indiawale in the show and reveal who, according to them, was a mastermind in the game . They unanimously felt that the celebrities were being too careful, dignified, well-behaved and image conscious whereas the commoners or the Indiawale were completely opposite of the celebrities and as a result were playing the game very well. Commenting upon Mona Lisa’s relations with her own teammates, the trio felt that she was being discriminated and she seemed to be more compatible with the commoners and as a result Manu Punjabi was taking advantage of the situation. They felt that Manu, Manveer Gurjar and Karan Mehra were smart players whereas Gaurav was a dull personality. After all the discussion, these housewives decide that it's time to have some fun as they give Salman a task where he needs to become a pani puri wala. Salman accepts their special request and feeds them some scrumptious and delicious pani puri. Later, on the show, the Mona's issue is being discussed by both the groups separately. While Mona, Manu and Manveer talk among themselves, the celebrities call Manu 'cheap'. Gaurav specifically points out that Manu stating that since she's is not very comfortable with her own teammates and hence she joins commoners, and that they like her company, was a cheap remark. The night then takes a humorous turn as comedy queen Bharti Singh makes an appearance along with her partner Karan Wahi to entertain the contestants with their comical gags and fiery jabs. None of the contestants are spared, especially Om Swami as Bharti and Karan joke about his 100-crore film undertaking. Being a total sport, Om Swami shakes a leg to Salman Khan's song ‘Baby Ko Bass Pasand Hai’ when Bharti urges him to do so. And soon, it was Lokesh Kumari's turn as Karan Wahi makes her audition to be the new host of Comedy Nights Bachao Tazaa but Lokesh forgets her lines! But, upon hearing Lokesh's voice, Bharti makes a keen observation; compares her voice to the indomitable Rakhi Sawant! The duo even grill the first week evictee Priyanka Jagga. From calling her a 'walking-talking-mooli' to pointing out Priyanka's absurd behaviour, Bharti leaves no stone unturned in poking fun at the loud-mouthed lady. The volley of gags at Priyanka only intensifies as Bharti reveals that Priyanka Chopra is now looking to change her name, lest she be misunderstood as Madam Jagga!